This book provides a reference for all kinds of crafts that involve ribbon. It includes step-by-step photographed instructions for a wide range of techniques as well as projects to accompany each area of ribbon crafting. This is a comprehensive guide as compared to most books on ribbon crafts that are specific by technique or end result (ribbon flowers, silk ribbon embroidery, making bows). 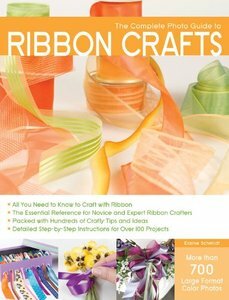 This book explores a wide range of techniques and end products, using all kinds of ribbon, making it an essential reference for all craft enthusiasts. It includes ideas and projects for scrapbooking, home décor, general crafting, and fashion.